What books should you consider as holiday gifts for the Texan in your life, or for someone who would like to learn more about Texas? As you can see from the picture above, Hamburger Wearing An Astros’ Hat would very much like to learn more about Texas. Hamburger is a member of the Texas Liberal Panel of Experts. 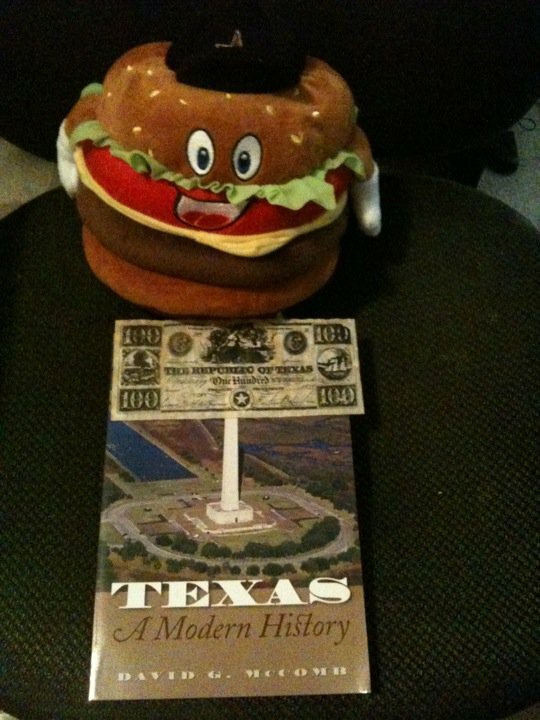 You will also please note that Hamburger is trying to use some Republic of Texas currency to buy a book of Texas history. While many conservative Texans might wish that this currency was still valid, I may have to spot Hamburger a few real dollars to purchase the book. Here is a list of some fine Texas- themed books I own. There are many others out there that I don’t own and are worthy of your consideration. The Texas Almanac is simply one of the best reference books I own on any topic. The Almanac is published by the Texas State Historical Associataion. The most recent edition of the Almanac was released just a few weeks ago. Unprecedented Power: Jesse Jones, Capitalism, and the Common Good by Steven Fenberg. This is a new release that I own, but have not yet read. Jesse Jones of Houston was a very powerful figure of the Franklin Roosevelt era who played a large role in crafting today’s Houston and our whole State of Texas. The Formation and Future of the Upper Texas Coast by John Anderson may sound dry. But is an accessible title with many pictures that will help you understand the geography and other aspects of the Texas coast from the Sabine Pass, to where the Colorado River flows into the Gulf Of Mexico. Texas A & M Press has published a variety of titles about life in the Texas portion of the Gulf of Mexico. I own four of these books and they are all very informative. Sam Houston–A Biography of the Father of Texas by John Hoyt Williams is a perfectly good biography of the great man. There are other out there on the same subject. 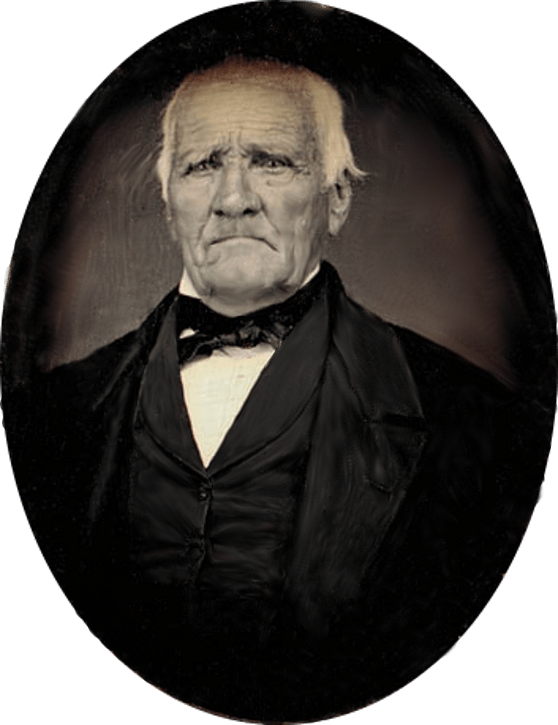 Maybe you’d finally like to learn more about Sam Houston after hearing his name so many times over the years. I’ve read all three Robert Caro books on Lyndon Johnson. There are two more planned with the next one out in the spring of 2012. Here is a link to reviews of the three Johnson books. These books are full of Texas history and are classics of American biography. Here is a recent post on the blog about two Texas art books that detail painters of the New Deal era. A great web resource to learn about Texas is The Handbook of Texas Online. This site is very comprehensive on aspects of Texas both past and present. The Handbook is also published by the Texas Historical Society. Learning about Texas will offer a more nuanced understanding of a place that for many—both in and out of Texas—has become little more than a Texas-sized caricature. 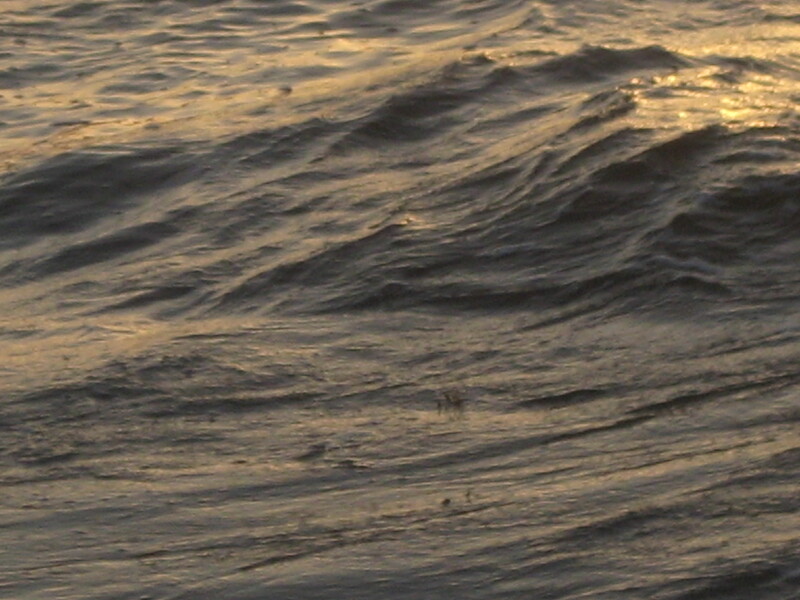 A record s0-called dead zone has been predicted for the Gulf of Mexico for 2011. While the dead zones end each year in September and are in some degree natural occurrences, they are greatly expanded by man-made cause and are symptomatic of our abuse of natural resources. 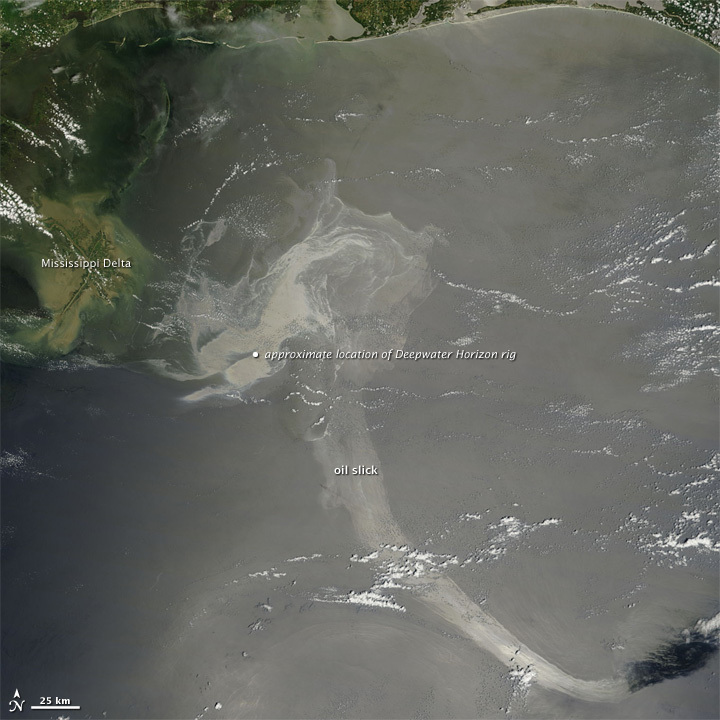 The cause of the ever-larger dead zones is the flow of the Mississippi River into the Gulf of Mexico. It should be recalled though that the Mississippi has many different inland rivers flowing into it, and that what ends up in the Gulf are contaminates from all across the nation. Agricultural experts in Missouri are looking for ways of planting crops that will reduce the size of the dead zone in the future. Here are some general facts about the Gulf of Mexico from the EPA. The Gulf of Mexico yields more finfish, shrimp, and shellfish annually than the south and mid-Atlantic, Chesapeake, and New England areas combined. The coastal population of the five states of the Gulf of Mexico is projected by the Census Bureau to increase from a total of 44.2 million in 1995 to an estimated 61.4 million in 2025, nearly a 40% increase. The Gulf of Mexico is a source of income for many with fishing and energy exploration. There is also the income that is genertaed from tourism from folks who enjoy the beach. 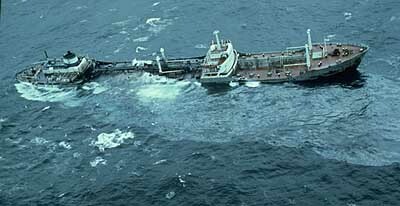 Regretfully, the Gulf is also a dumping ground of waste and filth and for accidents that spew nasty oil into the water. I’m certain that additional steps can be taken to protect the Gulf. These steps however will require an active public that demands action. The work of a better nation is up to each of us. A Pygmy Sperm Whale washed up on the beach in Galveston early on Wednesday. Above you see a Houston Chronicle picture of the incident. Here is the link to the Texas Marine Mammal Stranding Network. Unfortunately, the whale has since been euthanized. Here are facts about the Pygmy Sperm Whale from The American Cetacean Society. Here is a Houston Chronicle story about different types of whales that live in the Gulf of Mexico. An unusual number of dolphin calves have been found dead in the Gulf of Mexico in recent months. The article I link to above does not assert that these dolphin deaths have been caused by the BP oil disaster. It does say though that this is possible and tests are being done to determine the facts. 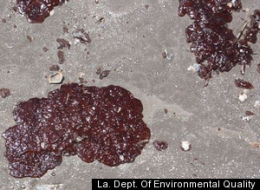 More concrete is the fact that large parts of the bottom of the Gulf of Mexico are covered with oil. Here is the web page for Dr. Samantha Joye. Dr. Joye led the study about the oil at the bottom of the gulf. Here is the Gulf Spill Restoration website of the National Oceanic and Atmospheric Administration. My friend Bob Cavnar has written about the oil at the bottom of the Gulf at The Daily Hurricane. 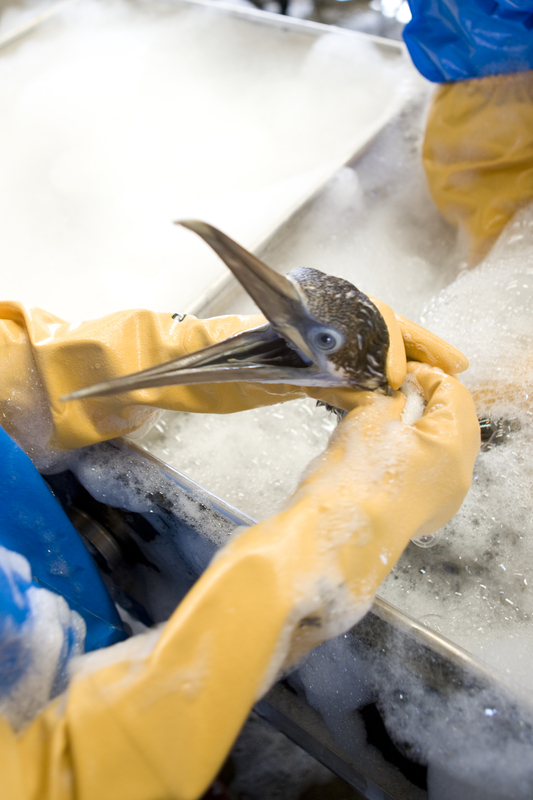 The impact of the BP spill may not be as bad as some first feared. But it appears to be bad enough. The government, academic researchers, the press, and groups such as Greenpeace should keep monitoring conditions in the Gulf. Every news story offers the chance to learn more than we know at the moment. It is up to each of us to learn about the world. When we learn more, then we are more likely to take action to improve the world. From the Marine Mammal Stranding Network of Texas are facts about the 29 types of marine mammals that live in the Gulf of Mexico. Here are some basic facts about the Gulf of Mexico. This site I link to here, Gulfbase.org, has far more than just basics if you would like to know more. A useful book on the coast in and around Galveston is The Formation and Future of the Upper Texas Coast by John Anderson. This book, published by Texas A & M, has scientific value while also being accessible. I cannot stress this fact enough—It is up to the individual to learn about the world and to take action to improve the world. You may well decide to take that action in concrt with others. But at core—You must decide yourself to be involved. Here is a picture I took of the Galveston Seawall this afternoon. I’m writing this post from Galveston. 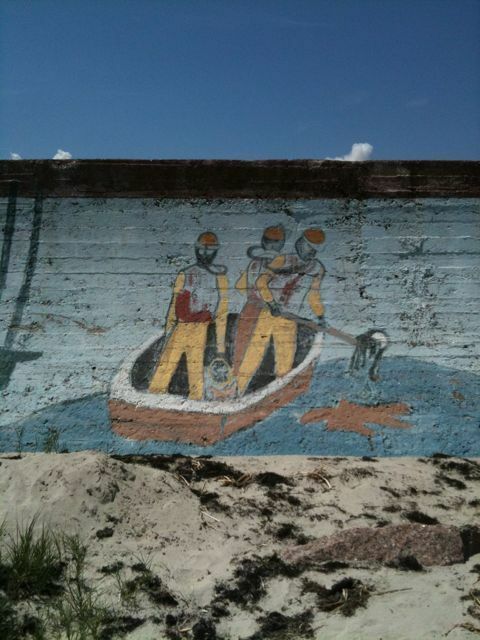 You see in the picture that people in gas masks are cleaning up muck in the sea. I don’t know when this was painted, but it seems that somethings don’t change. There is no oil off the coast of Galveston from the BP spill. 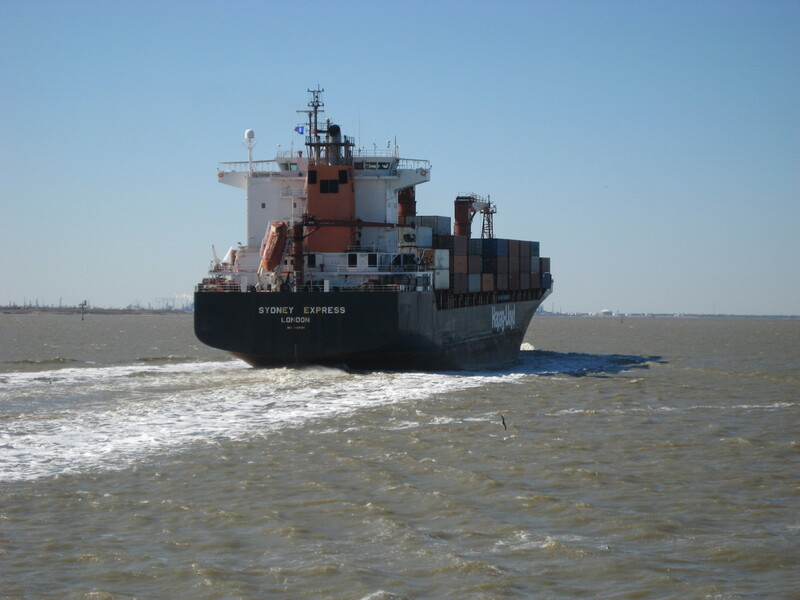 However, the Gulf of Mexico has long been a dumping area for all types of sludge and muck. There is no oil in Galveston or anywhere on the Texas Gulf Coast this Fourth of July Weekend. I’m not saying this to discourage you from going to any other Gulf Coast beach. They don’t all have oil. I’m just saying that Galveston has no oil. I’m a big fan of Galveston. There is a lot of history in Galveston and the people there are glad you have come to visit. Be sure to tell the folks on the Texas coast that a Texas Liberal sent you. 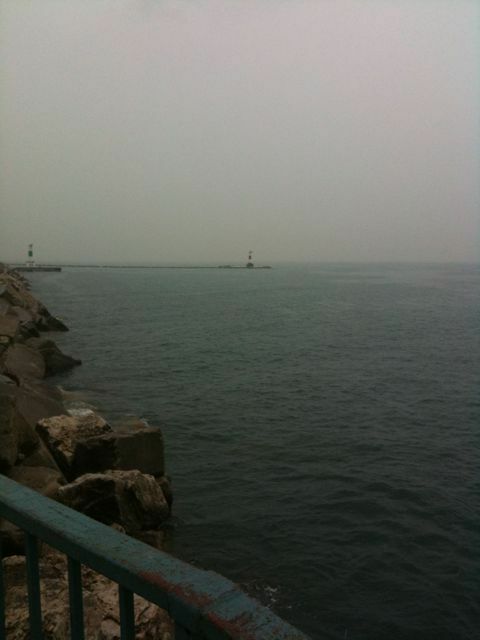 The picture in this post is of Lake Michigan at Kenosha, Wisconsin. I was there last summer. Kenosha is worth a visit as well. Black Man From Chicago To Offer Federal Government Help To Self-Reliant Deep South—Why Don’t We Put Them To Work Rebuilding New Orleans? President Obama has addressed the nation about the BP/Transocean oil disaster in the Gulf of Mexico. Here is the video of the speech. President Obama, a black man from Chicago, is going to use the powers of the federal government to assist Gulf Coast areas in the Deep South impacted by the spill. It is important that these folks in these coastal communities be allowed to maintain their way of life. Did you think their way of life involved a minimum of government involvement in their lives? Well..Kind of. If you live in a city and suffer from the effects of generations of poverty that is not your fault, then you need to pull yourself up. 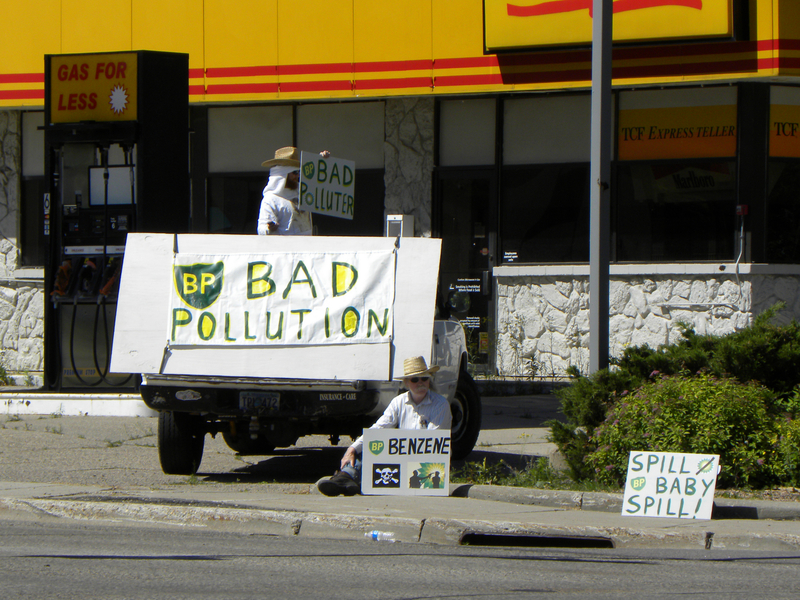 But if you are a Gulf Coast resident impacted by the BP/Transocean oil spill—That is different. In addition to self-reliance, another aspect of the Gulf Coast way of life is overfishing and ecologically destructive fishing methods. President Obama left that out last night. People in the impacted counties know how they feel about the role of the federal government. They want the federal government to do as little as possible. People need to work to get what they have in life. This is why Jefferson Parish, where Grand Isle, Louisiana is located, voted 62% for McCain in 2008. Grand Isle is very concerned about what the oil will do to local industries. In Pensacola, Florida, where the oil spill is also a big deal, the two Pensacola-area counties were strong in 2008 for Sarah Palin to serve as Vice President—Escambia County was 59% for McCain and Santa Rosa County was 73% for McCain. Louisiana parish’s that border the Gulf of Mexico were firm for the Republican ticket in 2008. Should folks in this part of the nation be helped despite a clearly stated preference that our federal government should remain as uninvolved as can be in the lives of citizens? Yes. These folks should be helped because they are people and all people matter. People matter even if they don’t respect the ocean resources that sustain a way of life they say they value, and they matter even if they would let you suffer when unexpected hardship comes your way. At the same time, folks need to hear the truth and they need to be reminded of the standards they hold others to when they are the ones asking for help. Maybe we could put economically displaced Gulf Coast residents back to work by having them rebuild New Orleans and helping New Orleans be able to withstand the next hurricane. We could do this as part of a federal jobs program. That would be honorable self-reliant work. …And if people want more regulation of offshore drilling and more regulation of companies that pay shareholder dividends while they are polluting the oceans…. ….Then let’s be clear about what people want. What people are seeing in the case of the BP oil spill is the case for an active government that regulates corporations for the good of the public. These are the points that liberals and progressive have been making for years. Do you really think corporations will ever do the right thing unless they are forced? Here is a link to President Obama’s five minute weekly speech for June 5. This week’s speech was made from Louisiana and is about the spill. Obama Press Conference On BP Spill And Other Topics—Full Texas Liberal Coverage! President Obama is holding a press conference today at 11:45 Central Time. I’m going to watch that conference on C-Span.org and blog about it as it is taking place. Above is the famous press conference where a man tossed a shoe at former President George W. Bush. 11:40—Watching the CNN coverage leading up the press conference. Blah. Blah. Blah. 11:49—The press conference has begun. 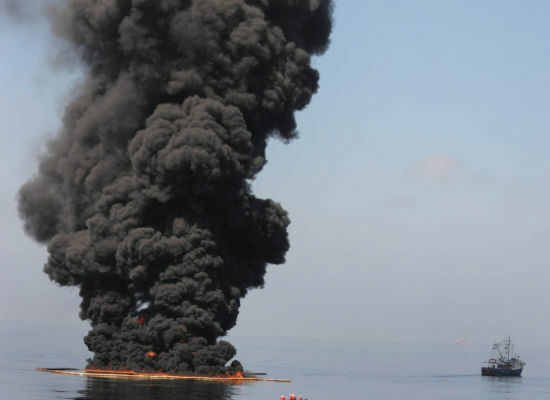 11:52–The President is saying that the Federal Government has been been strongly involved in addressing the spill and that BP is under the direction of the government. This may be so, but why are we hearing this strong assertion of the government’s role 35 days into the crisis. Why does Mr. Obama seem to wait until political trouble has begun to say tough things? 11:56—Mr. 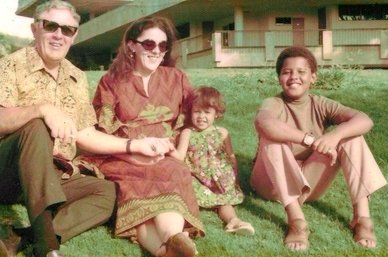 Obama says that the Gulf Coast is still a good place to visit. He says that only a small number of beaches in Louisiana are impacted by oil. I’d encourage you to visit Galveston, Texas on the Gulf Coast. It is a great place to take a walk and have dinner. 12:00—President Obama is making the case for regulation of the oil industry. By extension, he is making the case for government regulation in a number of regards. How can people look at this disaster and feel that private firms can be left to regulate themselves? 12:02–Mr. Obama says that this spill is a clear call for new sources of energy. But what about conservation? Don’t the people themselves bear some fault for our need for all this oil? 12:06—Just got up to get some macaroni salad for lunch. The macaroni salad package was open and I had to e-mail my wife to make sure that she was the one who had opened it rather than some crazy person at the supermarket. She replied and said that she had indeed opened the package. 12:09—Question asking if all possible has really been done when many are saying this is not the case. The President says our response has not been perfect, but does reflect the fact that all that can be done in a realistic sense has been done. I suppose you could say that about just about anything in life. 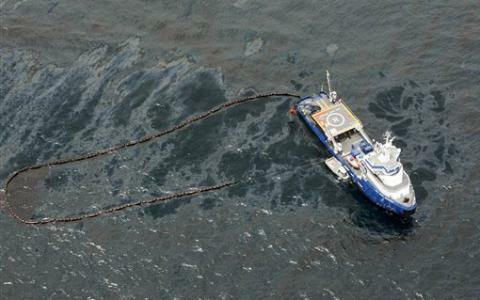 12:15–Question is about calls that the government take command of the spill response from BP. By that logic, which I have no problem with, the government could take over a number things that the private sector can’t seem to get right. Health care would be a good start. 12:18–The Texas Observer has a great story about how the Texas Commission on Environmental Quality is a friend of industry rather than a friend of the people of Texas. Some people in Texas live in a kind of oil slick of bad air each day. These folks need a disaster response plan as well. 12:22—The President is again saying that oil companies have not been well-regulated for offshore drilling. The next thing the President could better regulate is overfishing in the Gulf of Mexico that is being conducted by some of the very same people now upset that they can’t fish. 12:25–A question was asked if “heads should roll” over this spill. 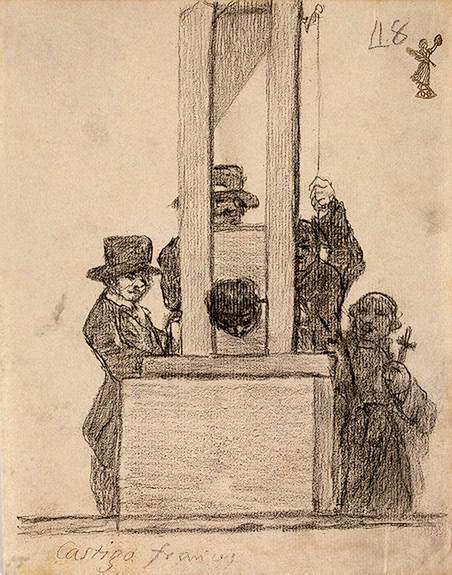 Below is Francisco de Goya‘s The French Penalty. 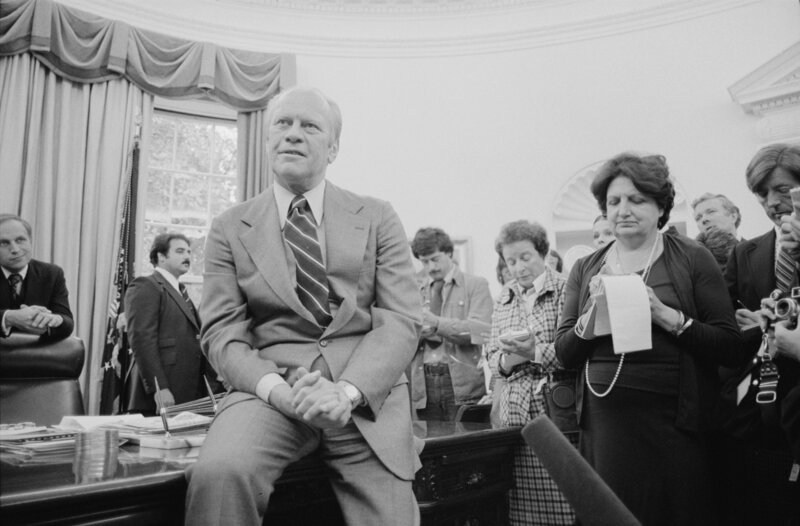 12:32–Helen Thomas wants to know when we are going to get out of Afghanistan. I was wondering a few days ago why opposition to our two wars seems to have become silent with Mr. Obama in office. It could have to do with the fact that the Iraq War is winding down. It could also be that some of the opposition was politically motivated and left-of-center political groups don’t want to criticize Mr. Obama. Helen Thomas is 89! Good for her. 12:38–Questions now about how Mr. Obama could have ever thought that the oil companies would do the right thing in the Gulf. Yeah–I agree. I don’t know how he could have thought that at anytime before or after the spill. 12:41—The President just referred to Republican Senator Lindsey Graham of South Carolina by his first name. I bet the Tea Party in South Carolina already has a press release up calling Senator Graham a socialist for being buddy-buddy with Mr. Obama. 12:46—Question about immigration and the Arizona immigration law. I think that the border of Texas with other states should be policed to make sure our ignorant textbooks don’t crossover to dumb down students in these other states. 12:50—The President says that the spill is what he thinks about when he goes to bed at night. He also says that he comes from Hawaii “where the ocean is sacred.” Here is how the sacred ocean in Hawaii is being treated in regard to health of coral reefs in that state. 12:55—Over and out. Here is a NY Times report on the conference. As I write this on the evening of Friday, May 14, there is no oil or any tarballs on the beaches of Galveston Island or at any Texas beaches that I am aware of. Here is what the Galveston tourism folks have to say about this matter. I like Galveston and I often drive 50 miles south to Galveston to take a walk on the beach and have lunch. 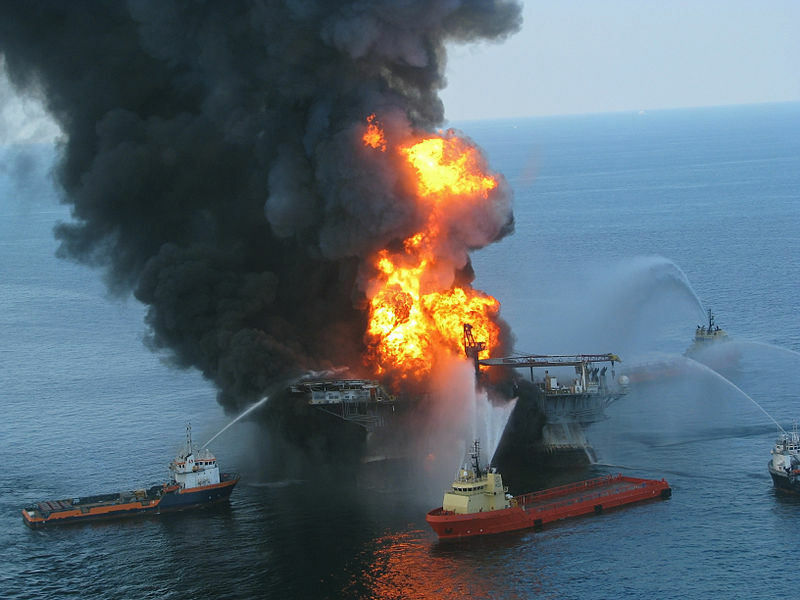 Rick’s Blog, writing in the Pensacola, Florida area, has concerns that his community is not telling the full story on the oil spill. Rick is correct to express this view. People will often say whatever is needed to make sure that business does not drop off. If any oil or tarballs do come to come to Galveston or to other Texas beaches, I will post on the issue. In the meantime, people should come to Galveston and enjoy the ocean and the history to be found in Galveston. Yet also, tourism officials in Galveston and at all points on the Gulf have the obligation to be candid about any oil or tarballs that may appear. Here is information about visiting Pensacola. The Gulf of Mexico Foundation advocates for the Gulf. Here are some basic facts about the Gulf of Mexico. Here is my post of facts about the spill.